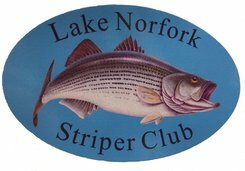 The Lake Norfork Striper Club meets in the Hensley Building off Bryant Street behind Eastside Baptist Church. Come early to talk about the current striper bite and to update our Membership Roster. Get tickets for great drawing prizes. ALL STRIPER FANS are always welcome.